Guide to learning about Down syndrome characteristics, including cognitive, behavioral and physical. Children with DS tend to have very distinctive features that make identifying this disorder relatively easy, but their are different types that make the set of symptoms different from one child to the next. The most common type, referred to as Non-disjunction or Trisomy 21, occurs in approximately 95% of those diagnosed and usually has more of the obvious Down syndrome effects that we are familiar with. In addition to the traits listed below, children will often have a variety of down syndrome characteristics that include medical conditions as well as a mild to moderate cognitive disability characterized by slower learning. However, the significance of symptoms will vary in each child. Treatment typically involves responding to the medical conditions and providing positive supports for any behavioral/cognitive challenges. There has also been promising evidence of using nutritional interventions as that has shown to improve and prevent many of the associated characteristics. Dental problems due to teeth coming in late or in uncommon order. As a result there are some individuals that may require positive behavior supports. For example, a child with a language delay that is aggressive when trying to communicate wants/needs may benefit from the use of a picture exchange communication system or implementing sticker charts to encourage/motivate positive behaviors and reduce refusals. Occupational therapy and physical therapy are also helpful in dealing with sensory issues or slow physical development. Many children can do very well when these treatments are used in conjunction with behavioral interventions. 1. Cauldwell, K. (2006). 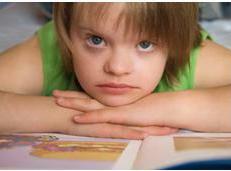 Down Syndrome Information: Characteristics of Down Syndrome. www.associatedcontent.com. 10-11-10.